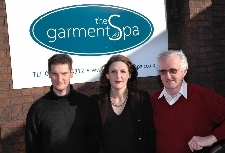 The Garment Spa is a family business, based in Denbigh, North Wales. We offer you the benefit of a professional dry cleaning, laundry and ironing service all under one roof. We try to provide you with a service as convenient and time-saving as possible, to make your life a little easier. Why not call in now and pick up your free, colour price list. We realise organising and co-ordinating dry cleaning is a hassle that''s why if you can''t get to us in Denbigh or our shop in Ruthin, we''ve carefully chosen our agents to make the process of dropping off and collecting your dry cleaning as painless as possible. Importantly, our agents are friendly and helpful and most have convenient parking and long opening hours, giving you more time and less stress. Our convenient and professional, quality service, knowledge of textiles and over 50 years of experience in the dry cleaning industry gives you a dry cleaner you can trust and rely on. We want you to be so happy with our service we give you a 100% Satisfaction Guarantee which gives you security and ensures us you''ll be completely happy with the end result, every time. To add value to our service and make dry cleaning a little more fun and worthwhile, we have regular competitions, special offers and discounts which are available with us and from all our agents. All future competitions, special offers and discounts will be posted on this web site, advertised in the stores of our agents or you can phone us at The Garment Spa for more details - 01745 813312. Please don''t hesitate to contact us with any ideas or comments -especially, if for any reason, you''re not happy with our service because you are our first priority and without you we wouldn''t be here.